Beatrix Li-Chin Loos, born in Ulm (Germany) of Taiwanese and German origin, lives and works in Strasbourg. After having worked in the fashion industry in Paris, she was involved for several years in the field of ecology. 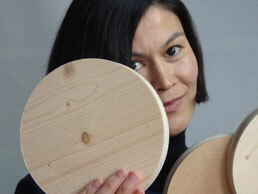 By working wood, her favourite material, and promoting eco-design, she finally found her way: to combine creative and artistic work with an ecological dimension. She trained in cabinetmaking at the famous École Boulle in Paris, and created made-to-measure pieces. When Beatrix Li-Chin Loos settled in the south of France, the idea of reusing scraps of wood became perfectly evident, and she started making her first pieces. When arrived in Strasbourg she then developed her first collection. Chut ! de bois was presented at the Parcours du Design 2009 in Strasbourg. Very quickly she combined wood with other materials such as cardboard and leather: Chut ! Collections was born. Since then, Beatrix Li-Chin Loos has exhibited in renowned design galleries such as Galerie Gosserez in Paris. During the international fair of contemporary art Art Basel and Design Basel in June 2012, her creations have been showcased at the Art Shop of the prestigious Fondation Beyeler. In May 2013, a retrospective of her work was presented at the Council of Europe in Strasbourg. Since 2012, she has regularly participated in the Paris Design Week by exhibiting at La Cité de la Mode et du Design. In 2018, she took part for the first time in the Biennale émergences, at the Centre National de la Danse de Pantin, near Paris. Beatrix Li-Chin Loos was a finalist of the 2013 Grand Prix de la Creation de la Ville de Paris in the field of design, the reputed City of Paris award. In 2014, she was shortlisted for the Justus-Brinckmann-Förderpreis Award, and a selection of her work was exhibited at the Museum für Kunst und Gewerbe, the Hamburg-based museum of decorative arts.